Repost from so long ago. I haven’t seen it before… Is that supposed to be Cronos? It’s by Gustav Vigeland. Not sure what the title is (or whether it has one). Without a doubt the best kind of birth control. I wouldn’t say so much birth control as after-birth control. This is in Vigeland park in Oslo. It’s an amazing place to walk around. There are hundreds of Vigeland statues, all of naked people interacting in crazy ways. In the center of the park is a giant obelisk of writhing people. 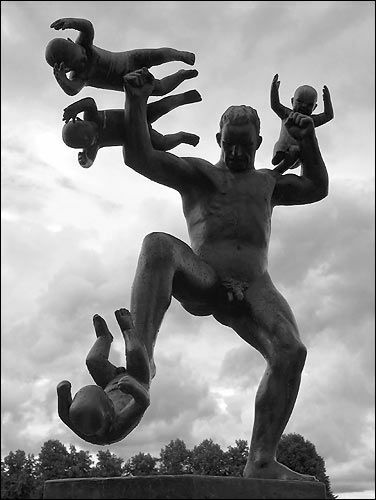 google “Vigeland” and look at the pics. I like the fact that no one mentioned that he’s NAKED.